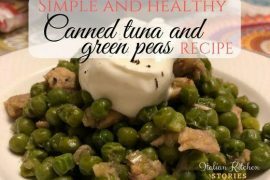 Just like most of the Italian appetizers, this one you can make almost all year round. All depends if you can get a good fresh melon in your stores. 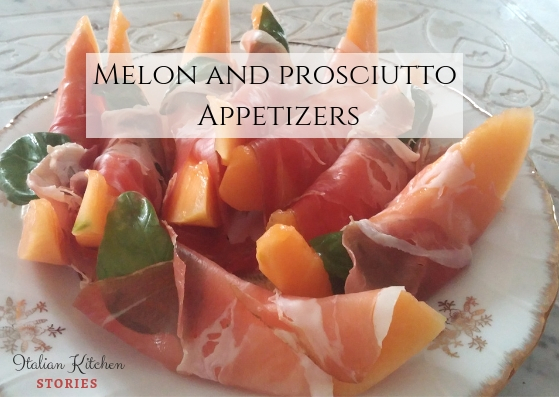 For melon and prosciutto appetizers we use cantaloupe, but I have also tried honeydew and it wasn’t bad, only a bit more delicate to wrap the slices of prosciutto. 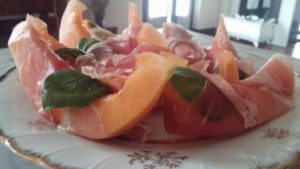 Since melon in Italy is seasonal fruit, we eat it from spring to fall and in plenty of combination apart from standard melon and prosciutto. So, let’s get ready to make our melon and prosciutto appetizer. Now wrap the prosciutto around the melon. Sometimes if I don’t have prosciutto I use similar dry and smoked meat choices, such as speck. I like to decorate the melon and prosciutto with fresh basil leaves, but you can also drizzle them with balsamic vinegar or balsamic vinegar cream reduction. If I’m expecting guests and I’m preparing it for later I would wrap leave for the last inserting basil or balsamic vinegar as I will keep it in the fridge and I don’t want flavors to blend too much before serving time. 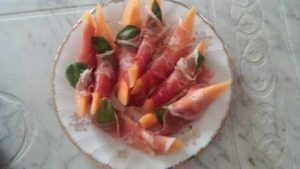 You will see once you start preparing it, melon and prosciutto appetizers will become your go-to Italian summer food.